March is National Tick Awareness Month Expanding tick populations are a growing concern for pet owners who seem to have more questions than ever, despite the large amount of information in media and on the Internet. Ticks are expanding their range in Canada. That means the risk of pets and people being exposed to ticks and the diseases they can carry – like Lyme disease – is growing. What are the risks in our area? What can you do to reduce them? 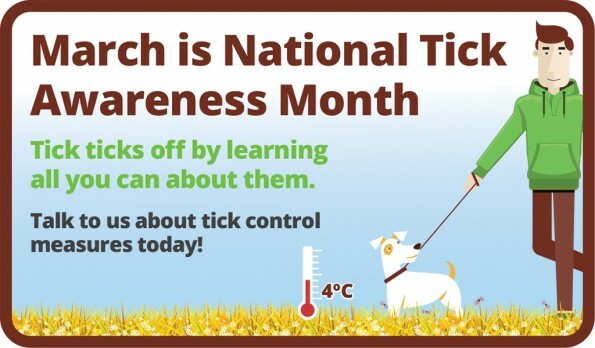 We can help answer those questions, and set up a tick control program for your pet. Give us a call at 780-352-7006 or email us at [email protected]! A tick-free dog is a healthier dog! Generally known as vector-borne disease, the risks they pose to your dog can be minimized with preventive measures (topical medications, chewable tablets, etc.) and annual checkups include vector-borne disease screening. This is especially important, as symptoms of vector-borne disease are often vague and difficult to recognize. Because of this, many pet owners don’t know their dog is suffering from a debilitating tick disease until it’s too late.